Description: Tufted semi-aquatic annuals to short lived perennials to 1.2 m high. Culms erect, smooth, glabrous; nodes 3–4, smooth, glabrous. Sheaths tightly enclosinf culm, becoming loose with age, smooth, glabrous. Ligule membranous, 3–16 mm long, triangular, rim often pilose with hairs to 2 mm long; auricles membranous, curved, usually with hairs to 3 mm long; blade 6–11 mm wide, smooth, glabrous, margin scabrous or smooth. Inflorescence paniculate, open, nodding, 8–21 cm long (excluding awns), to 5 cm wide (excluding awns). 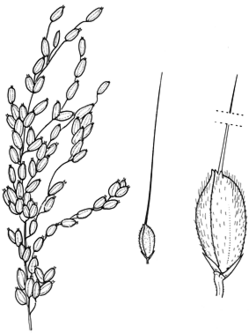 Spikelets solitary, c. 7 mm long (excluding awn), c. 3 mm wide, florets 3, lowest 2 sterile, uppermost floret female; pedicels 1–6 mm long, smooth, glabrous. Glumes scale-like, c. 0.25 mm long. Sterile lemmas c. 2 mm long, acute, awnless, smooth, glabrous; palea absent. Fertile lemma 6–7 mm long (excluding awn), acute or acuminate, awned, 5-nerved, nerves with rigid hairs to 1 mm long; awn terminal, straight, to 46 mm long, scabrous, base often smooth; palea subequal to lemma, acuminate, 1-keeled, keel and apex often with rigid hairs to 1 mm long, colliculate. Grown as a crop and sometimes in roadside ditches and drains, especially in rice areas. Other Australian states: *Qld *W.A. *N.T. Text by S. W. L. Jacobs & K. L. McClay; updated Jacobs, S.W.L., Whalley, R.D.B. & Wheeler, D.J.B. Taxon concept: Flora of NSW 4 (1993); Grasses of New South Wales, Fourth Edition (2008).